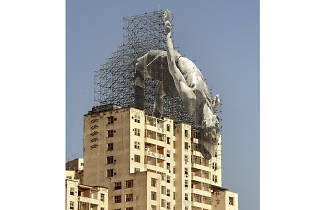 French graffiti artist JR first came to prominence when one of his pieces of ‘pervasive art’ – large photo-prints he hangs or pastes around the streets – appeared in the background of footage from the 2005 Paris riots. 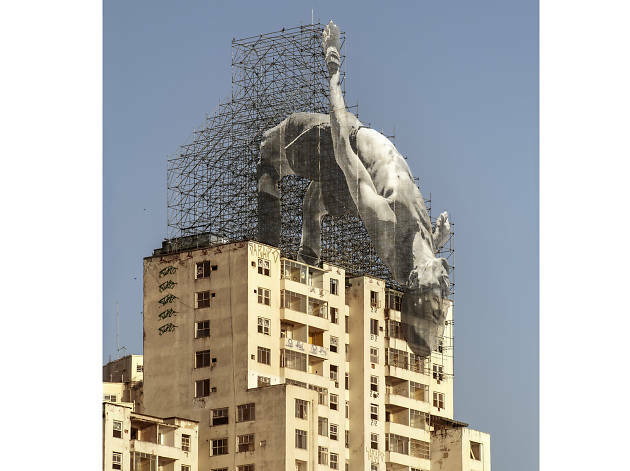 He has since become a hot artist to legally commission, and for the 2016 Olympic Games he made enormous prints of athletes jumping over Rio’s buildings, swimming in its ocean, and diving off its mountains like Greek titans. His current exhibition at Lazinc gives you some sense of the scale of that project, but in a regular-sized Mayfair gallery space. The viewer has to walk underneath the massive paper head and shoulders of Sudanese high jumper Mohamed Younes Idriss, fixed to scaffolding, just to get in. But ‘Giants – Body of Work’ is billed as a ‘behind the scenes’ exhibition, and it mainly describes JR’s process on a smaller scale. The architectural plans and installation permits are collaged into 3D-printed digital reliefs of the final images: an innovative, figuratively layered approach to distilling the original project. Straight photographs of the monuments in situ look good, but hardly recapture their impact. The problem with massive installation art is that it’s hard to shrink down into a conventional gallery without diluting it. Fabulous images can be weak if they’re only a reproduction of the original at a remove. So the most successful attempts to transmute JR’s work here go for a different kind of awe entirely. Black-and-white ink-on-wood depictions of the monuments have a gouged quality, the scaffolding supporting the massive prints appears like barbed wire, the athletes look like religious figures in medieval wood carvings: Christ mid-Passion. When this little show really gets kicking, sporting legends become gods, and size is no longer the only thing that matters.